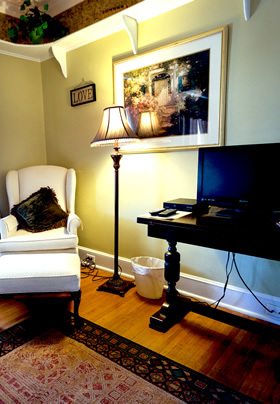 Our most affordable room, the Emerald Rose features a queen-size wrought-iron bed and original hardwood floors. 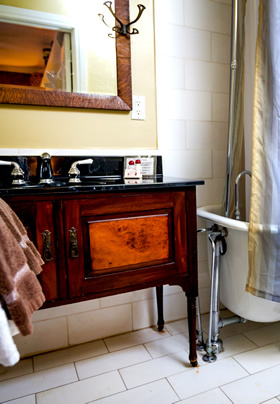 The bath has a claw-foot tub/shower combination and a converted antique washbasin. You’ll love the romantic feel and decor of the room and the lovely view of the pool and ponds outside your windows. An elevated shelf that circles the entire room once was the course for the model train of Dr. McCleary’s grandson. Now it is the repository of an enchanting variety of curios, with rope lighting.